Do512 Family’s goal has always been to help families do awesome stuff in Austin. 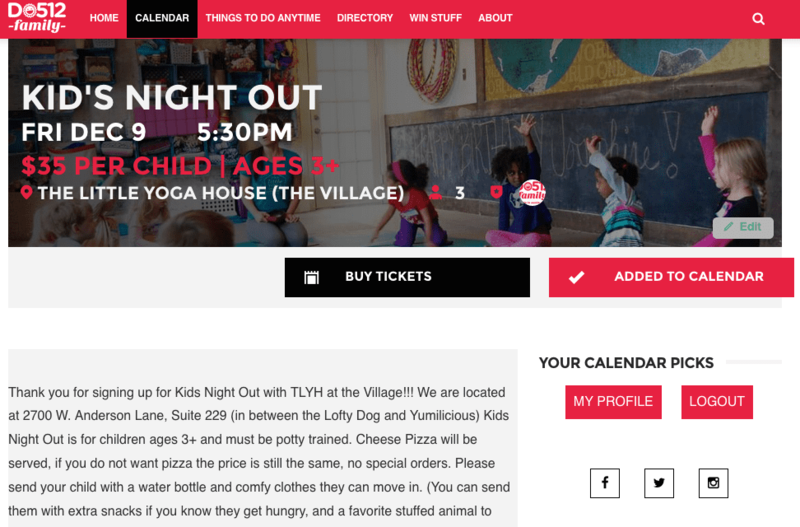 Our website includes an up-to-date events calendar that’s chock full of all of the kid-friendly activities we can find! But did you know that you can customize this calendar just for you? You can create your own calendar to include all of your favorite events in one little place. You can even print it out if you want and hang it on your fridge every week! 1) You will need to create a profile with Do512 Family. You do that by going here and clicking Register. 2) Fill out the Register box with your email address and create a password. Be sure to check the boxes and join our email list where we send our favorite events of the weekend, along with fun giveaways and insider details! 3) After you register, you will be taken back to our calendar page where you can immediately start adding events that you are interested in, simply by clicking the arrow to vote on your chosen events. To see all of your favorite events in one place, click on My Profile. 4) Your profile will have all of the events you added, and will even have the option to Print Your Schedule. 5) Go out and have fun! Questions about setting up your calendar? Send us a note at do512family@do512.com. If you know about an event that is not listed on our calendar, click here to find out how to add an event. Thanks for being a fan of Do512 Family!